It doesn’t matter if you are a frequent flyer or just catch a flight every now and then - keeping track on where and how you have flown is easy and fun. Add your past and future flights to your profile manually, by using our flight information lookup tool, or by importing from TripIt. Let other users know what you thought about your flight by rating and reviewing. 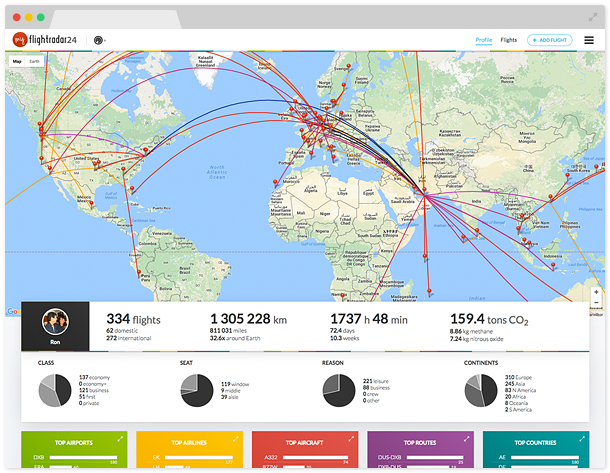 See all your flights on a map and get beautiful statistics on your most visited airports, most flown aircraft, CO2 emissions, and more. Share your profile with friends and let them track you on Flightradar24 whenever you are in the air.